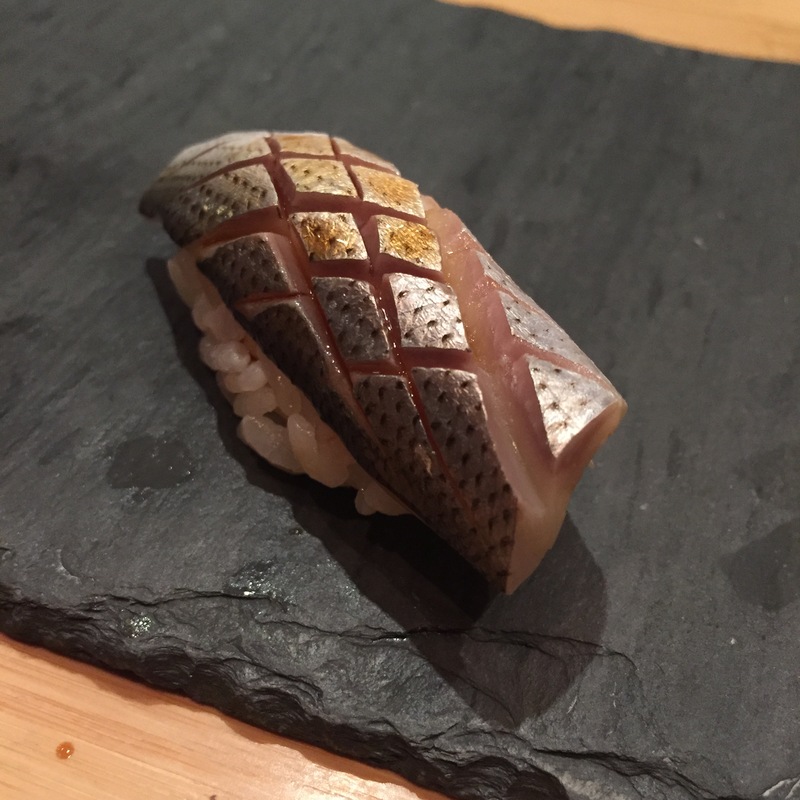 Review 1 – Apr 2016 Chef Shimao Ishikawa – One of the most well rounded omakases I’ve had, incredible fish, incredible experience. 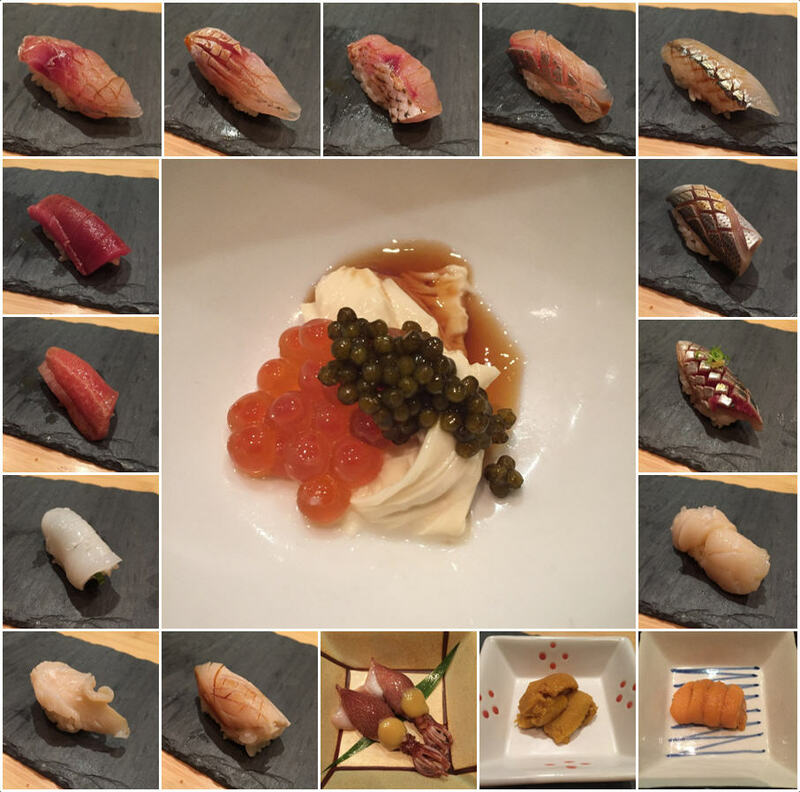 Review 3 – Mar 2018 (today’s review) Chef Mitsunori Isoda – A complete 180 in the best of ways! As always, the fish was great, but today, the EXPERIENCE was also GREAT! Isoda-san was friendly, engaging, and super chatty! Shared tons of sushi/fish wisdom with us. An all-around great time. 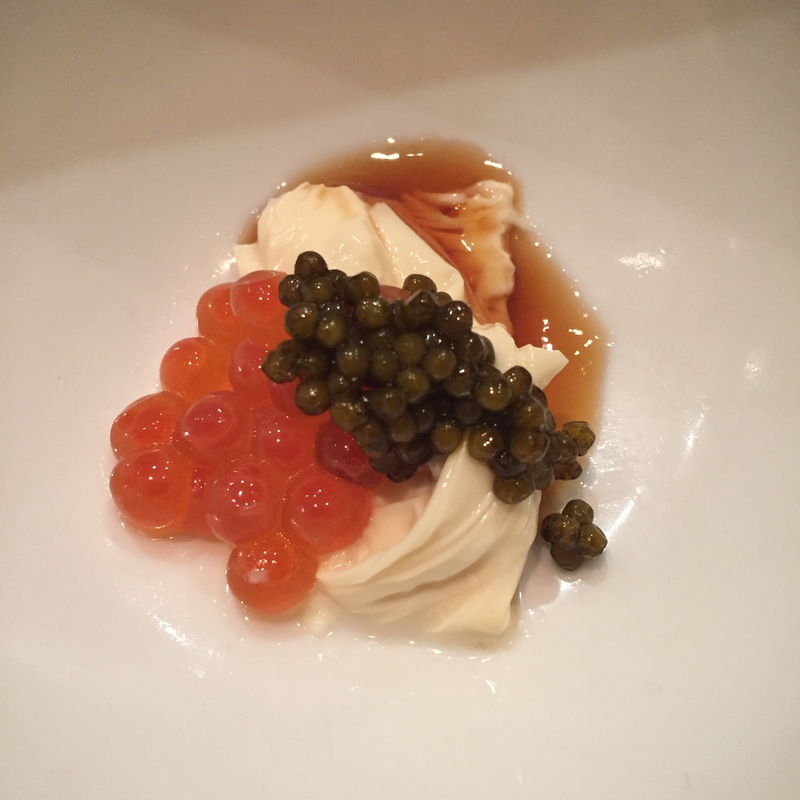 Yuba (tofu skin) IKURA (Salmon Roe) and Hackleback Caviar – Not a huge fan of Yuba, but this was very silky, and the combination of the IKURA, Hackleback and Dashi really did bring this Yuba (the otherwise most flavorless and boring thing to eat) to life. 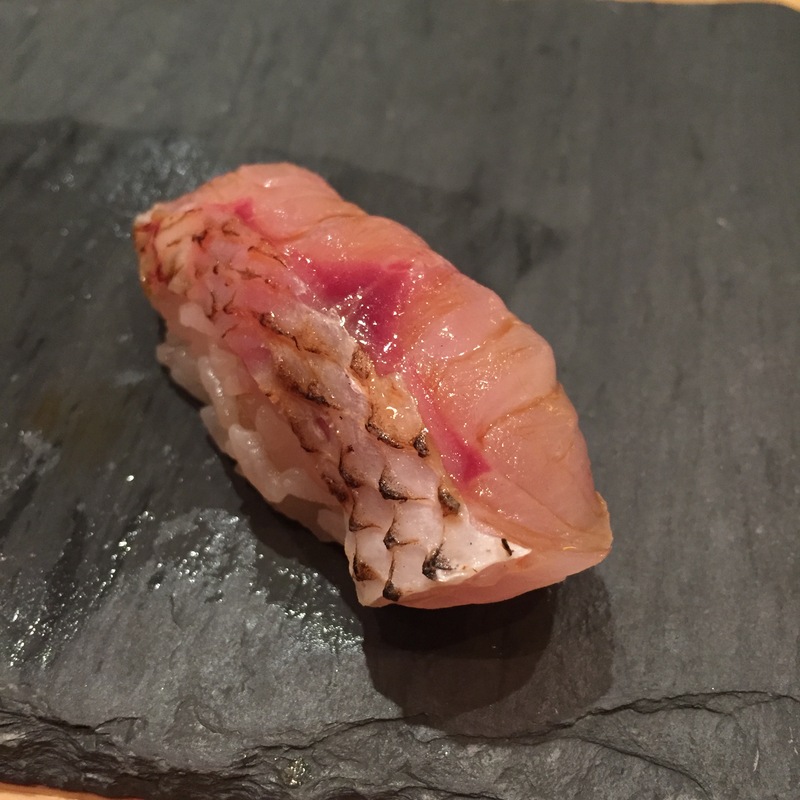 KANPACHI (Amberjack) – I forgot how good Isoda-san’s rice was. The KANPACHI was really nice, great flavor, great crunch. 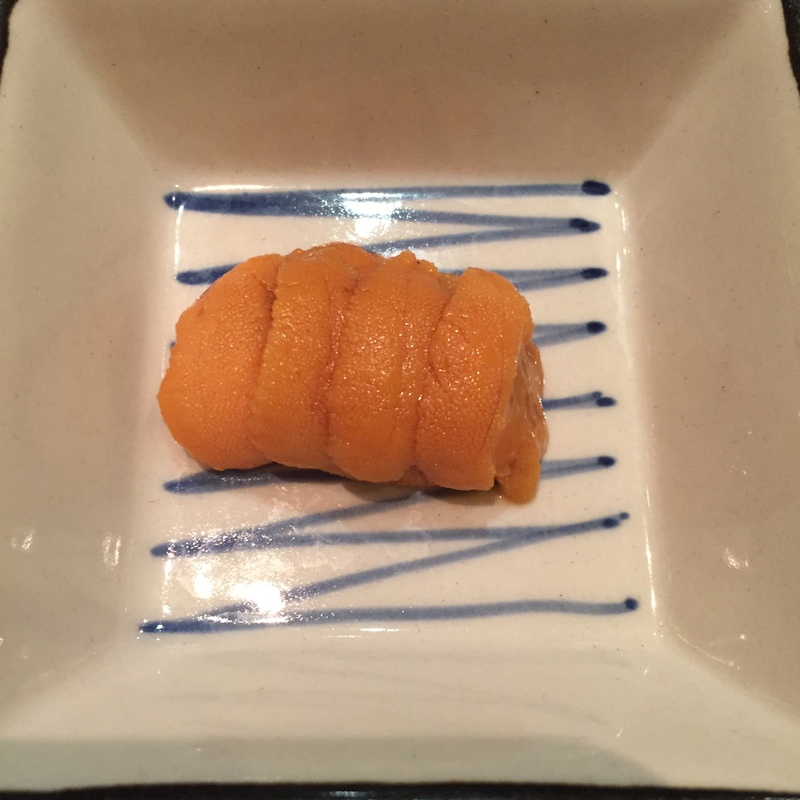 SAYORI (Needle fish) – Isoda-san said that this was the beginning of the season. Is it??? We’ve been having it for months! I wonder if chef got his “beginning” and “end” mixed up. Well, actually, isn’t this the middle of the season? I thought we get this through Spring? Whatever, makes no difference. It was plenty yummy. Very fresh, beautiful flavors, and a great crunch. Very nice. 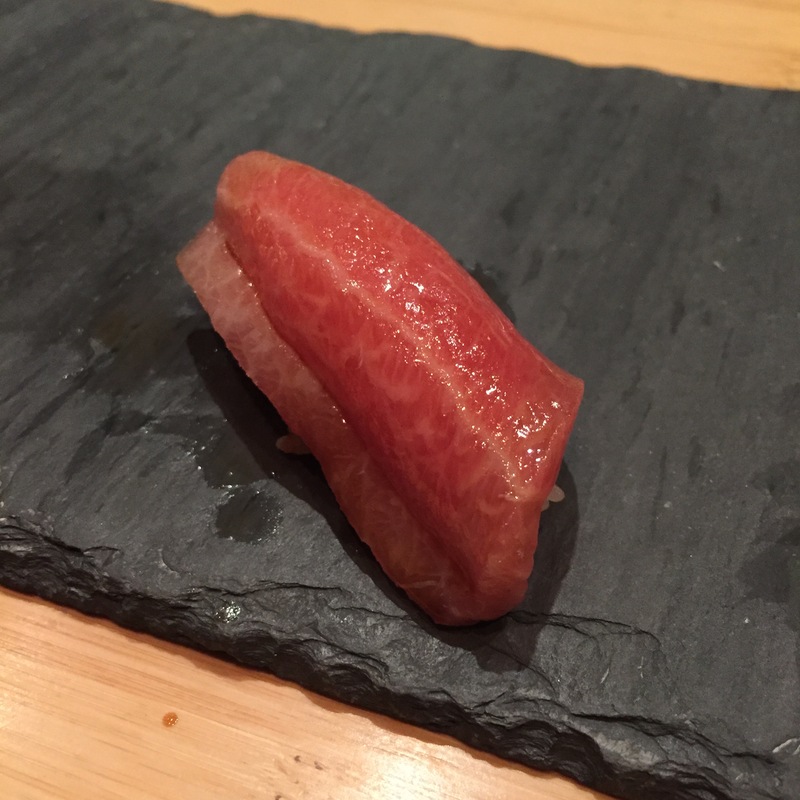 KAMASU (Barracuda) – I don’t know why, but Isoda-san’s KAMASU never looks like everyone else’s KAMASU. Isoda-san AGAIN said this was the “beginning of season”. And again, I have been having this for a couple of months already, so I’m super confused. This one was not as nice as the last two servings, a bit veiny, and a tiny hint of fishiness… While this was still delicious in its own right, I really do prefer it with the skin, and the skin ABURIed or even seared. That added smokiness is what makes the KAMASU incredible. SHIMA AJI (Striped Jack) from Kisho island – Rounding off the silvers round, Isoda-san presented us this not so good looking SHIMA AJI, but it tasted perfectly good. 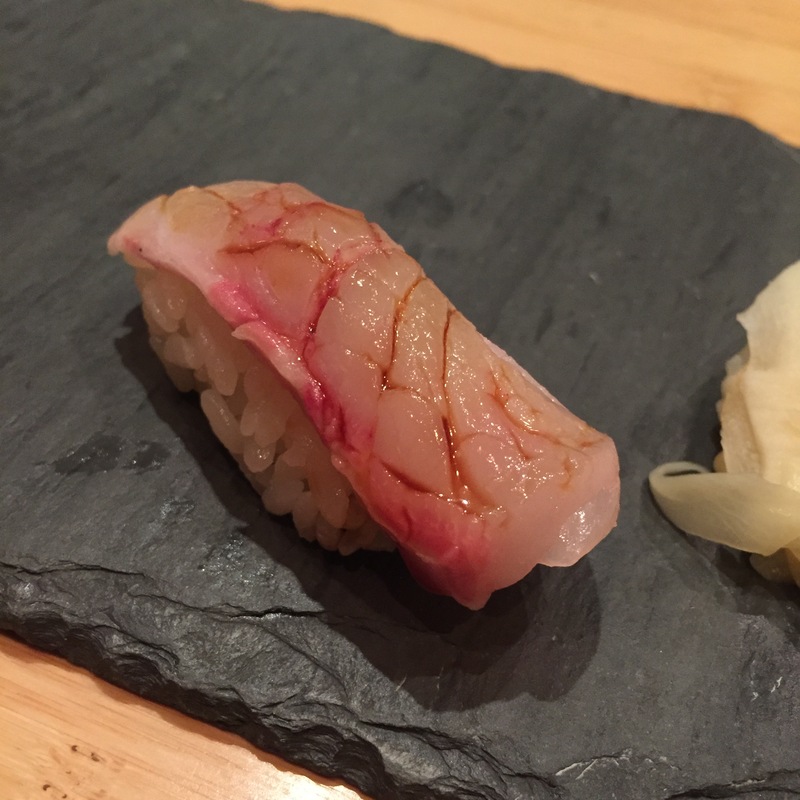 JI-KINME (Golden eye snapper from outside of Chiba) – Tasted exactly like a KINMEDAI, but apparently, the JI-KINME from Chiba just looks different (lighter colored skin). It was VERY NICE, the Yuzu pepper added a great little kick. 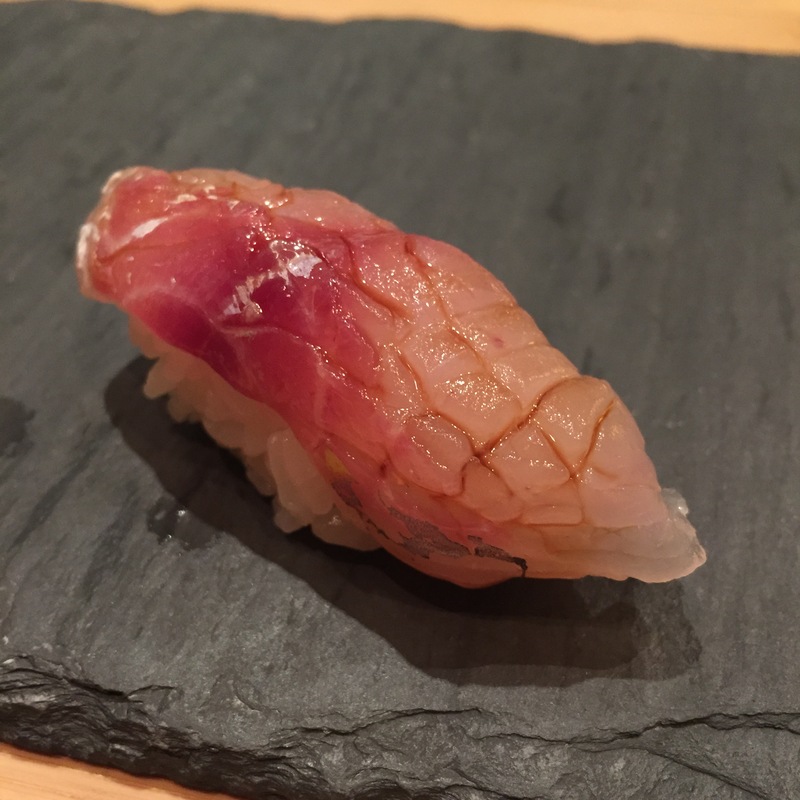 NODOGURO (Black throat) from Tokamachi city – I’m learning so much today! JI-KINME from Chiba is the same as KINMEDAI everywhere else, NODOGURO from TOKAMACHI city is AKAMUTSU if from anywhere else in the Pacific. Unlike the JI-KINME vs KINMEDAI. 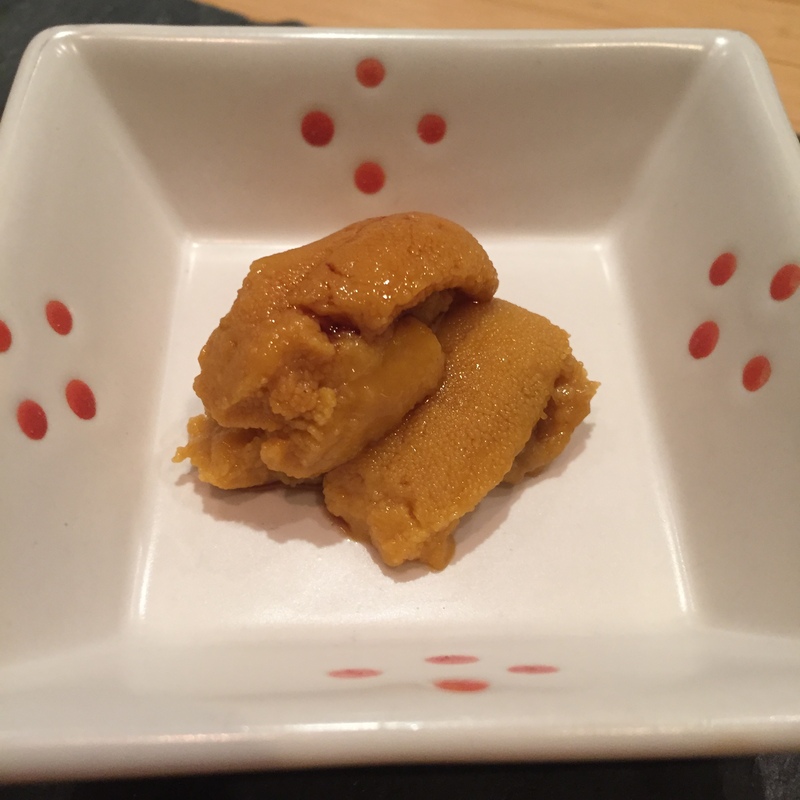 The NODOGURO and AKAMUTSU, both look AND taste very different. This had an amazing fattiness, and an incredible smokiness. Really delicious. 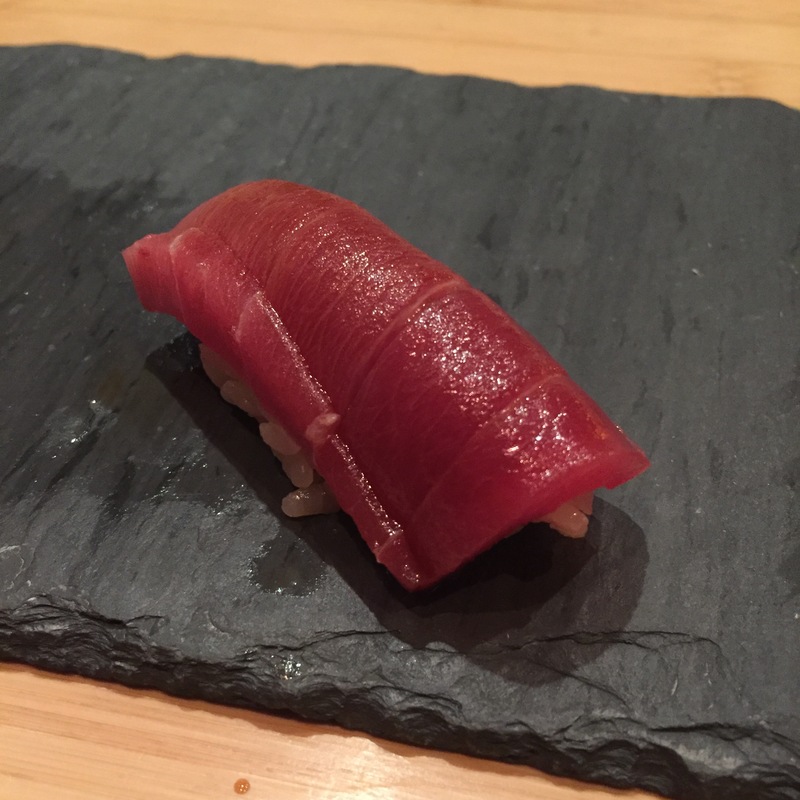 CHUTORO (medium fatty tuna) from Spain – Really hope that wasn’t the end of our whites round… Despite it looking like an AKAMI, this was indeed a fairly fatty cut of Tuna. Tasted wonderfully, but a bit chewy (vein). 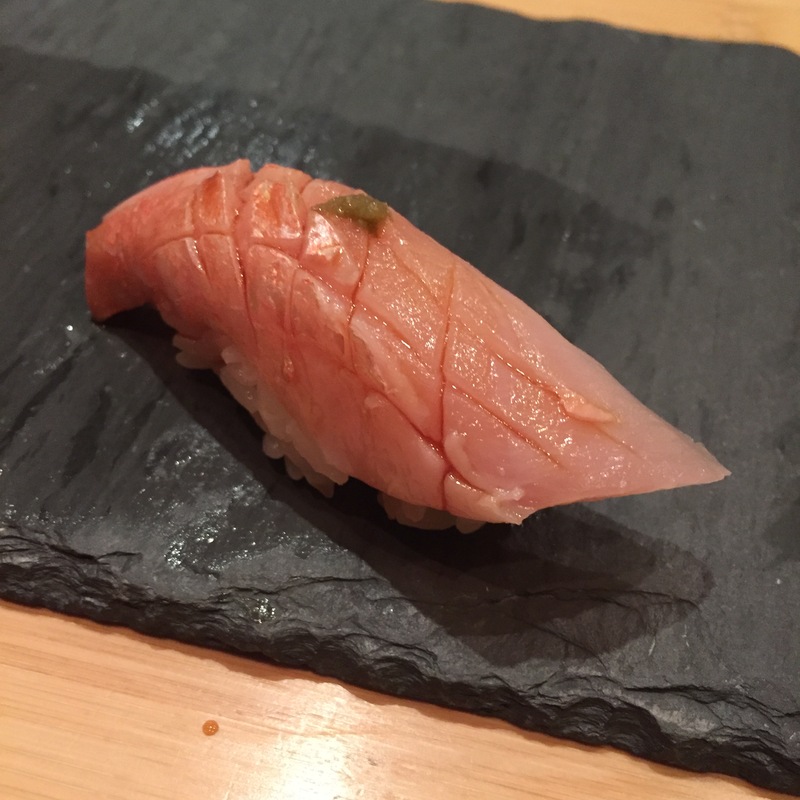 KAMA TORO (Toro from the collar) also from Spain – Interesting, just two Tunas? This cut wasn’t chewy, and it was super duper fatty. BUT you really taste the fat. 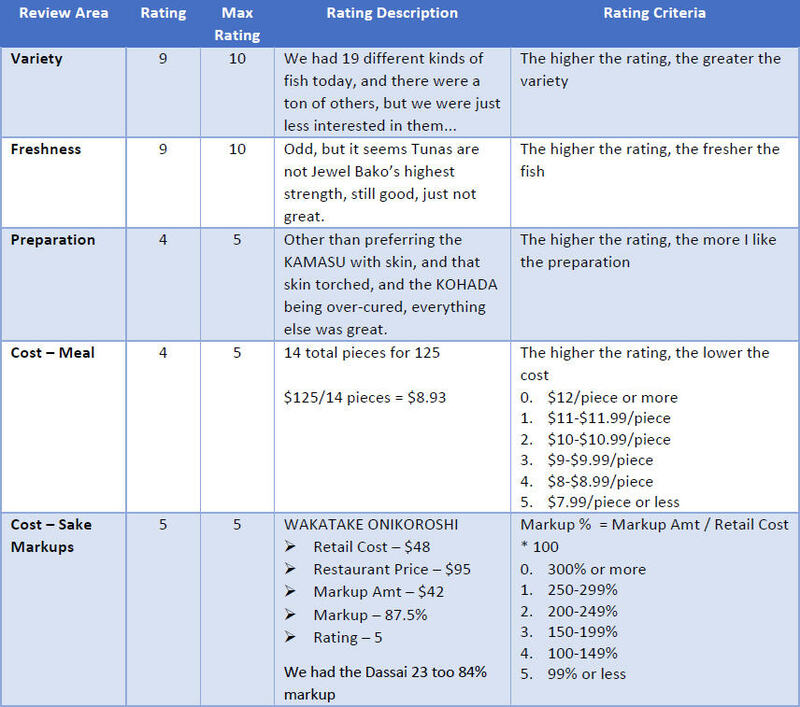 Sorry to say, the Tuna round was underwhelming. 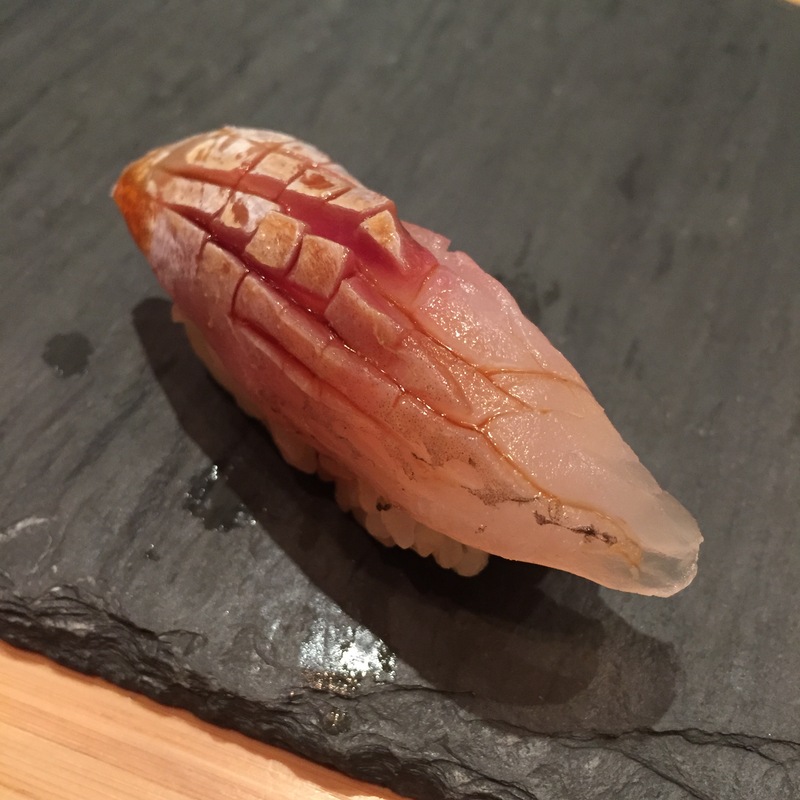 KOHADA (Gizzard shad) – Huh? We’re going back to silvers? We should have stopped it at the initial 4 servings, with 3 GREAT and 1 good servings, with this fifth serving, we are now going to the borderline territory. Borderline to not good. This KOHADA was fishier than normal. It was over seasoned, over cured. SURUME IKA (pacific squid) – Onto the mollusks we go! Served with salt and SHISO, this was so light and bright, and not at all gummy, just fantastic! 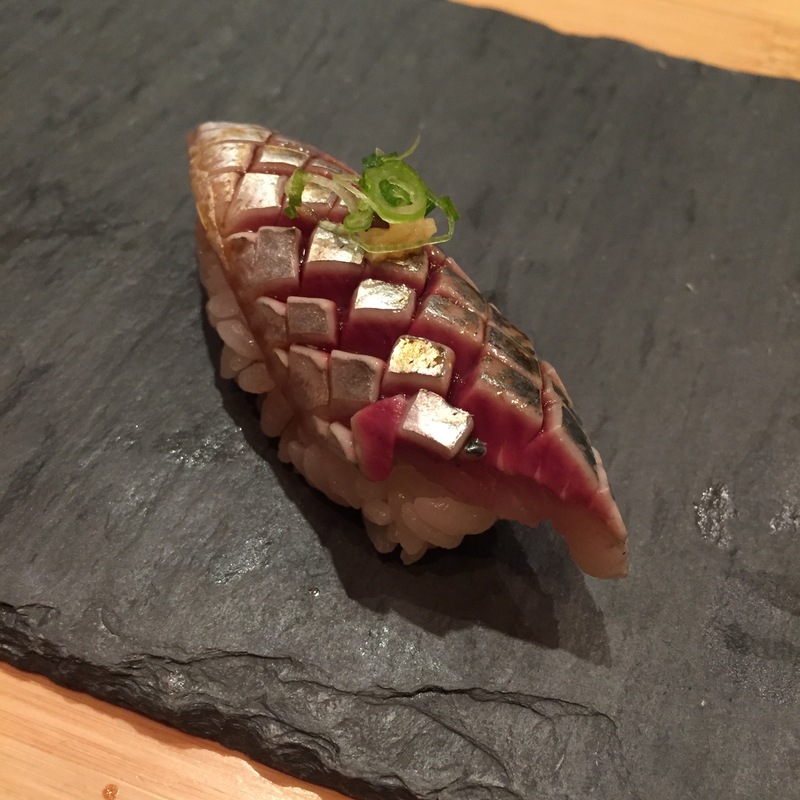 AJI (Horse Mackerel) – Back to silvers we go? 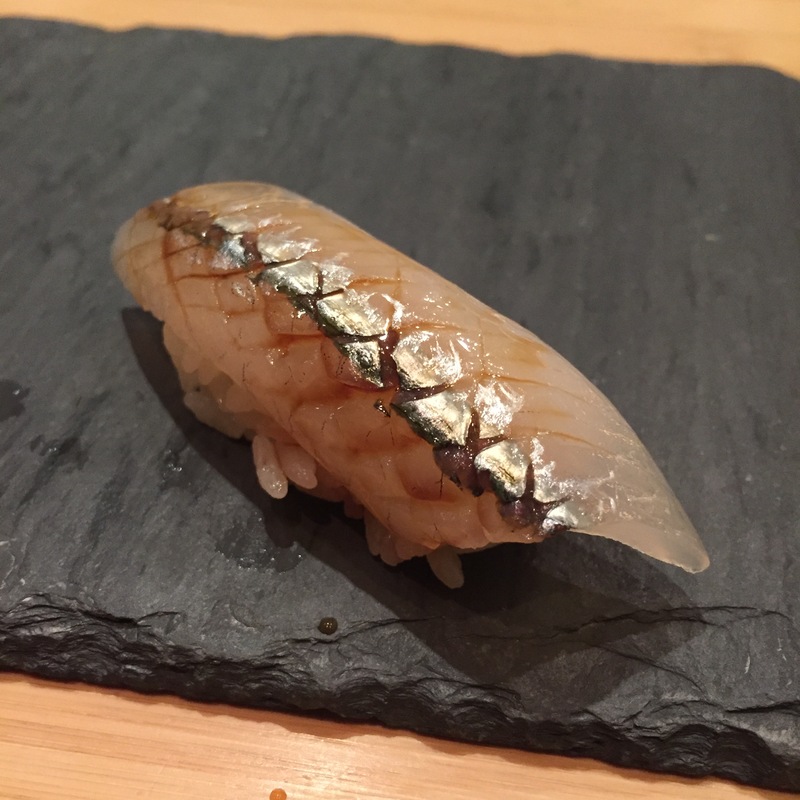 I’m so confused… I have to say though, this was an AMAZING cut of AJI. Unlike the KOHADA, this was treated perfectly. The flavors were incredible. So happy! 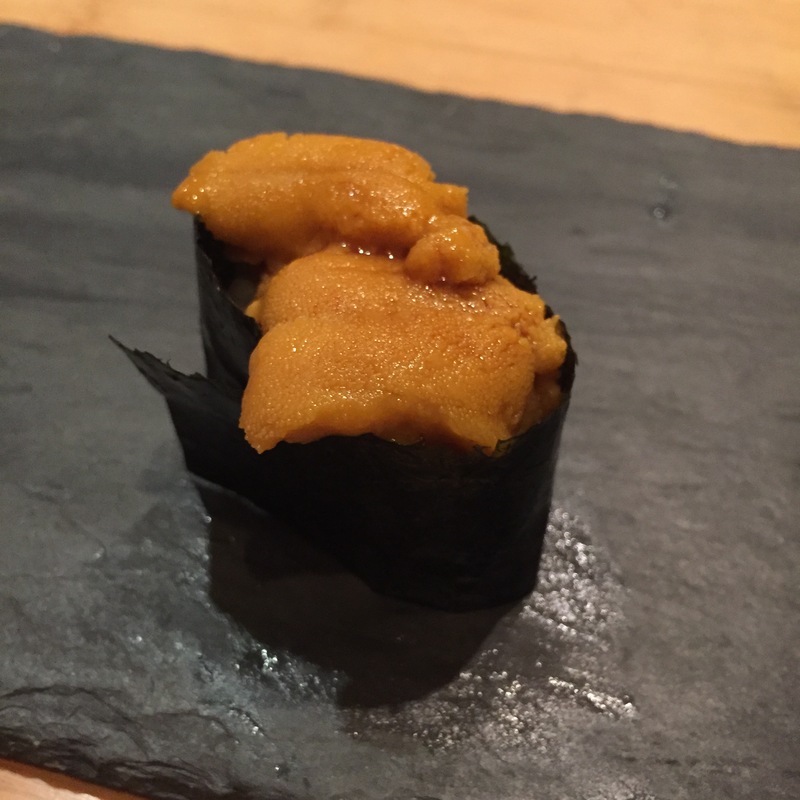 IKE HOTATE (Scallop) – Oh my! 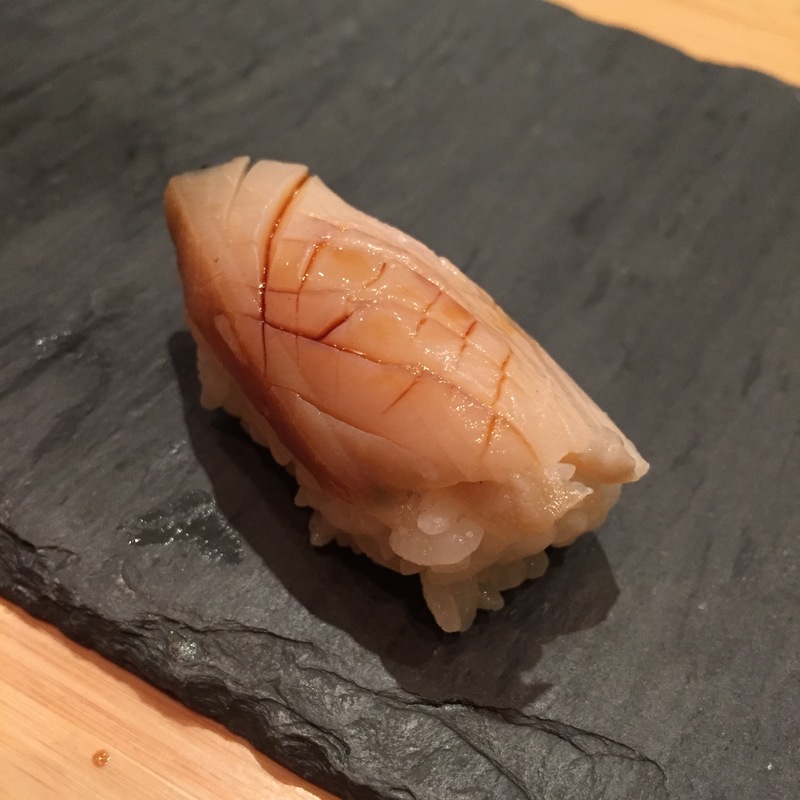 The mild hint of the sea, the way this cut melted… This was an exquisite cut of HOTATE. 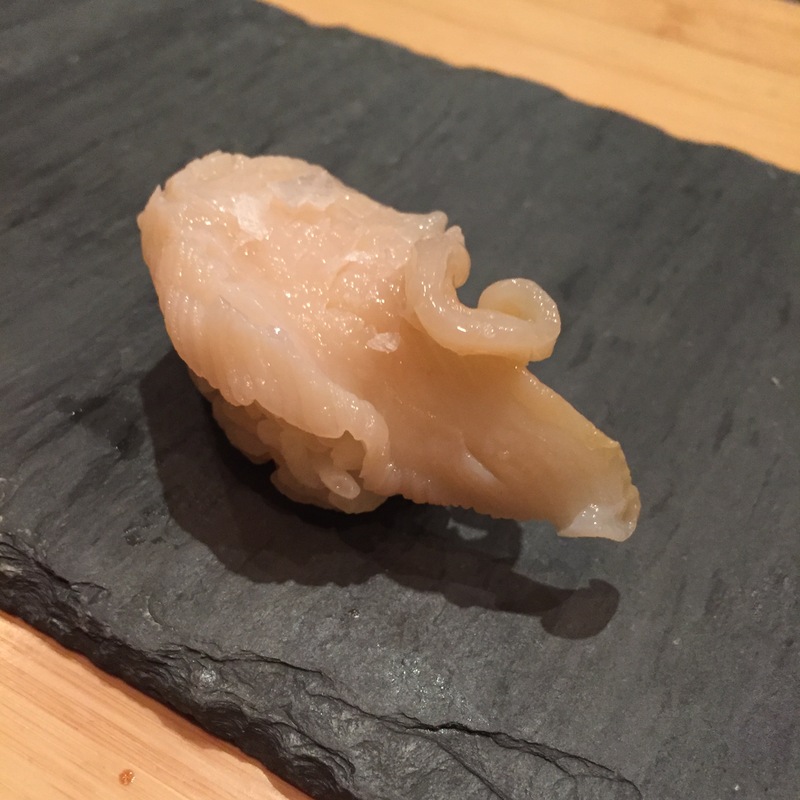 MIRUGAI (Giant clam/geoduck) – ISODA-san is killing it on the mollusk round! The texture, the flavor, the hint of sea, but light salt, just perfect! 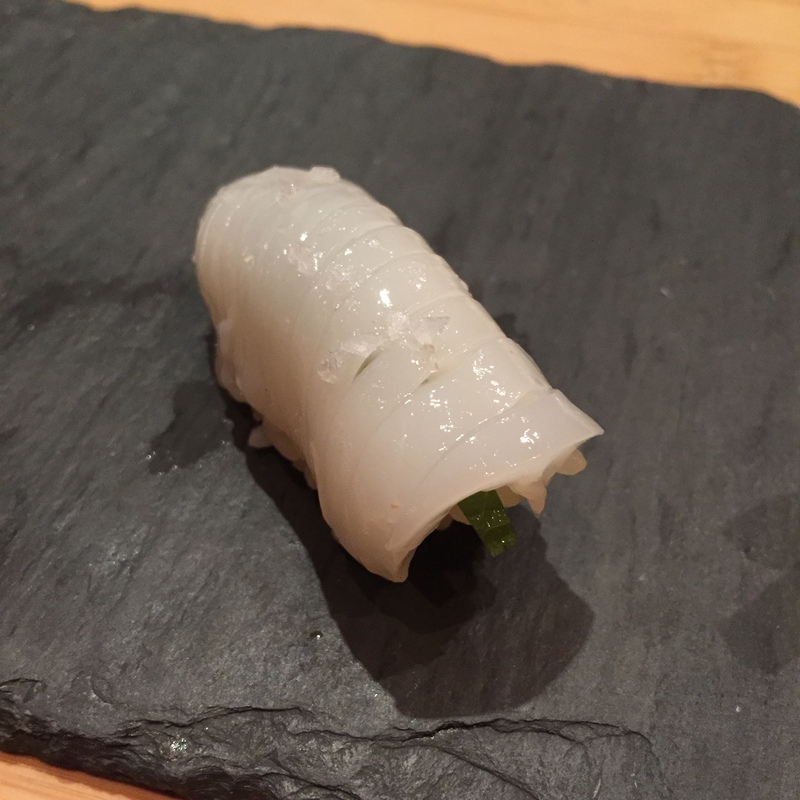 AWABI (Abalone) – Continuing with his incredible mollusk round, another delectable serving! 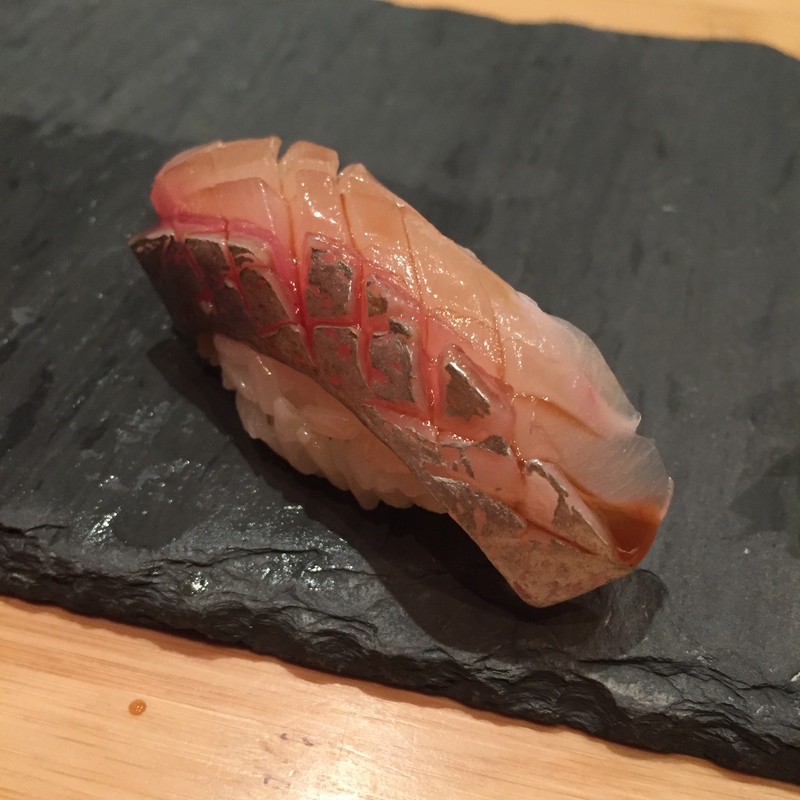 ISHIDAI (local seabream) – We are clearly done with the omakase, so the last few pieces were all add-ons. Both the previous whites were so great, we wanted more. When Isoda-san offered the ISHIDAI, we snatched it right up! Just the perfect level of fat, while still leaving this fish a super light and bright fish. Great! 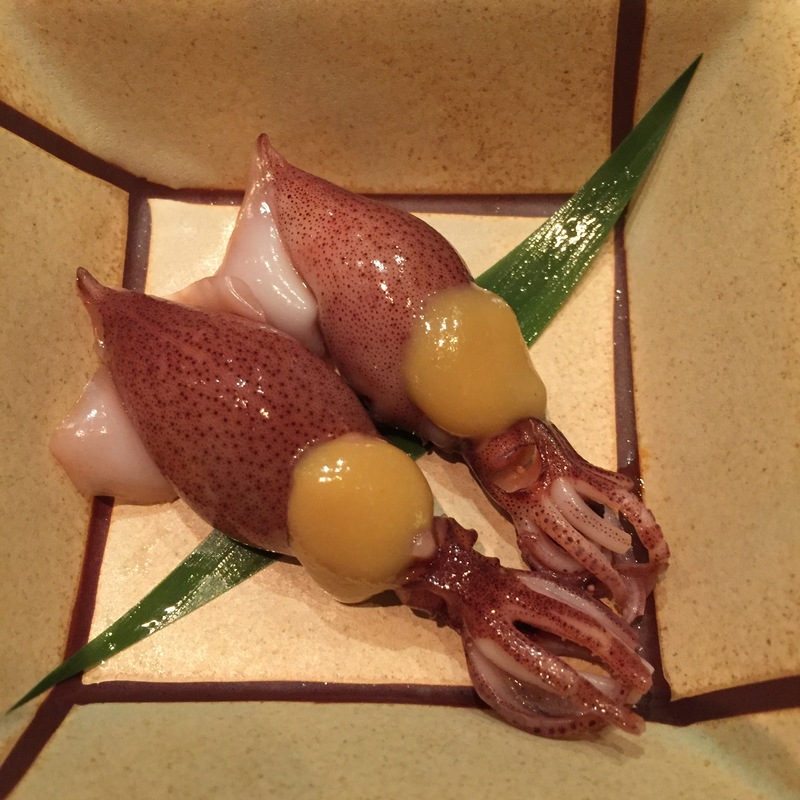 HOTARU IKA (Firefly squid) from Toyoma – These were some of the BIGGEST HOTARU IKA we have ever seen. We ended up ordering 2 MORE of these. 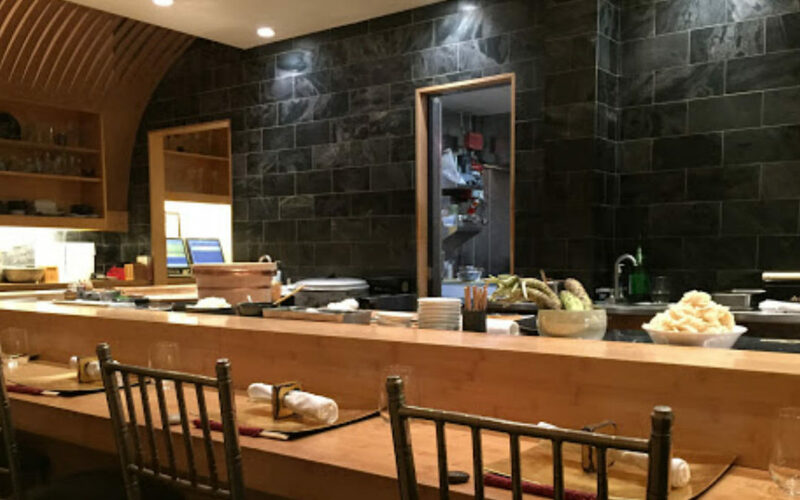 Per chef, the HOTARU IKA from Toyoma is steamed while still live, and then immediately packed. These were incrediblly sweet and savory at the same time. Again, we ordered 2 more, meaning we each had 6 of these beauties. Need I say more? I am SO GLAD to report we are back to being big-time fans of Jewel Bako. Again, they never disappointed us in terms of food, but it’s still possible to have a horrible experience while being served great food. But that’s all in the past now. Can’t wait to come back!